Start off your visit on the 25th (Sat): learn about winemaking at Taltarni Vineyards and then do a tasting at Summerfield Cellar Door. For other places to visit, ratings, reviews, and tourist information, read our Moonambel road trip site . Melbourne to Moonambel is an approximately 2.5-hour car ride. Finish up your sightseeing early on the 25th (Sat) so you can travel to Natimuk. Natimuk is a town in Western Victoria, Australia. On the 26th (Sun), contemplate the waterfront views at Olivers Lake and then admire the majestic nature at Mount Arapiles-Tooan State Park. For maps, where to stay, photos, and tourist information, use the Natimuk online trip itinerary planner . Traveling by car from Moonambel to Natimuk takes 2 hours. Finish your sightseeing early on the 26th (Sun) so you can travel to Halls Gap. Step out of Halls Gap to go to Great Western and see Best's Wines Great Western, which is approximately 32 minutes away. There's lots more to do: play a few rounds at Grampians Adventure Golf, tour the pleasant surroundings at Halls Gap Zoo, take some stellar pictures from Reed Lookout, and don't miss a visit to Boroka Lookout. 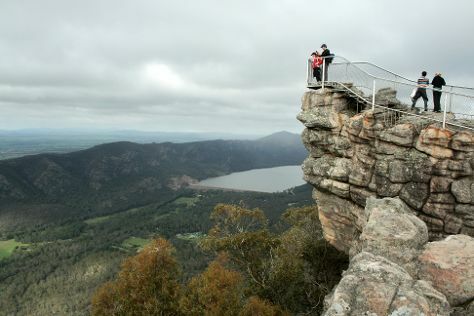 Plan a Halls Gap trip in moments using our itinerary builder. Traveling by car from Natimuk to Halls Gap takes 1.5 hours. Finish your sightseeing early on the 29th (Wed) to allow enough time to drive back home.